Grab your friends and get locked in. 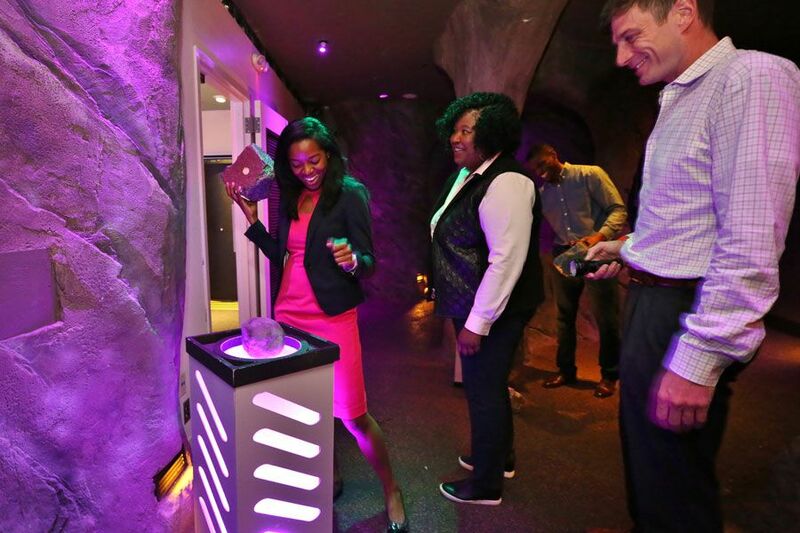 The Franklin Institute is one place you’ll find escape rooms around Philadelphia. Photograph courtesy the Franklin Institute. You’re trapped in an unfamiliar place and the only way out is to find clues and solve puzzles with strangers, friends, and/or co-workers. If you got “works well with others” on your Kindergarten report card, you might do well in an Escape Room challenge. There are lots of these games in the Philly area, so you’ll have no problem finding a room that fits your style — from the pop culture-oriented Escape the 1980s to the spooky The Haunting of Chestnut Hill to the intense Meltdown at Escape the Room Philadelphia. Actually, they’re all pretty intense. And that’s part of the appeal. Rarely in our daily lives are we called upon to think outside the box (literally) — and rarely do our problems have such satisfying, sensible answers. Ready for some adrenaline-fueled puzzle solving? Here’s where to get locked in around Philly. The Dig: You’re an excavator/archaeologist digging around in the dark. I’ve done this one and it’s a good time. The Agency: A top-secret spy mission type thing; there are two identical Agency rooms, doubling the chance you’ll get the time slot you want. Meltdown: You have one hour to stop a nuclear meltdown; for experienced escapists. Escape the Thai Prison: You’re caught smuggling “illegal substance” and locked up Brokedown Palace-style. A riot breaks out and that’s your chance for you to break out, too (2-12 players). Escape Jack the Ripper: You’re a London detective trying to track down the notorious serial killer (2-8 players). Alice in Wonderland in the Nick of Time: Outwit the Mad Hatter in this Lewis Carroll-inspired adventure (opening soon). A Quest for Freedom: It’s 1776, an you need to scour Ben Franklin’s private papers to find the documents he needs to convince France to support the American Revolution. The Midnighters: Break into your uncle’s boxing gym and find the moon rock he stole back in 1979. Makes perfect sense. The Art Gallery: Solve an art-themed mystery while also looking for the exit (10 players maximum). Case Closed: You’re a secret agent trying to escape with important documents before the authorities find you (10 players maximum). 1970s Mojo Room: A groovy disco time-warp type thing (6 players maximum). Use your knowledge of pop culture and tech from the Me-First decade to get back to present day. Sounds like it’s more fun than Ready Player One. Island Escape: Escape the clutches of a deranged millionaire puzzle-maker in a tropical setting. Escape from Alcatraz: Work out the clues to break out of the infamous prison (4-14 players). Caribbean Pirate Ship: Use mystic stones to get your galleon to shore (2-8 players). Time Trap: You’re a time travel cop trapped in Philly’s past (2-10 players). Philadelphia Phrenzy: Save the city from unnamed forces aligned against it (4-10 players). Prohibition Pandemonium: Sneak out of the speakeasy before the cops catch you; two rooms (2-10 players). Up to 8 players, 60 minutes, 707 Chestnut St., second floor, 267-819-2618. Escape the Hydeout: You’re an investigator trying to solve a Dr Jekyll and Mr. Hyde-themed puzzle. $25-$31, 60 minutes, 2-8 people, 8217 Germantown Ave., 267-300-6879. The Wizard of Greystone Abbey: You’re the heir to a massive fortune, now you just have to find it. The Haunting of Chestnut Hill: Your team of paranormal investigators has to match wits with an unruly ghost. The Shady Hat Shop Heist: How’s this for a premise? “Your family owns the very best hat shop in all of Chestnut Hill” and your uncle recently invented “a revolutionary new hat design.” But then a competing hat shop swiped the prototype, and it’s up to you to steal it back. Bank Heist: Break into the vault and escape with the cash (2-8 players). Mayan Tomb: You’re an Indiana Jones-type adventurer, trapped in an ancient crypt (2-8 players). Slime Factory: An ooey, gooey puzzle for kids age four to 12 (2-12 players). The Unknown: Heed the warning: “Extremely Scary, not for the faint of heart” (2-6 adult players). Runaway Train/Mission to Mars: These two new rooms are opening soon. Sounds like a Speed and space puzzle, respectively (2-8 players). The Cabin: You’re trapped in a spooky cabin in the woods. The Prom: You’re trapped at your high school prom. I think. It sounds zany, and I like it.